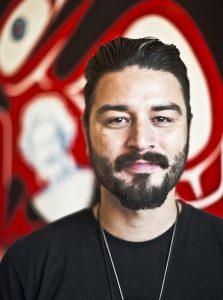 Bracken Hanuse Corlett is an interdisciplinary artist hailing from the Wuikinuxv and Klahoose Nations. Bracken’s practice fuses painting and drawing with digital-media, audio-visual performance, animation and narrative. Some of Bracken’s notable exhibitions, performances and screenings have been at Grunt Gallery, Vancouver International Film Festival, Urban Shaman, Mackenzie Art Gallery and Toronto International Film Festival.